Altar’d State presented Children in Crisis a check for $3,882.75 to help provide a home and care to the abused, neglected and abandoned children of the local community. 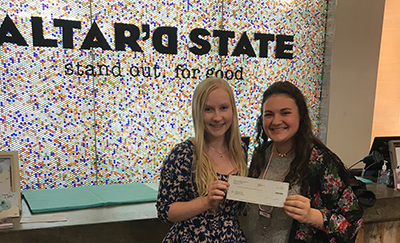 The donation funds were collected by the Altar’d State employee volunteer program called “Mission Monday.” Seen here, Lesley Lowrey (left), CIC office manager, accepts the donation from Halee Bryant of Altar’d State. Ashley Vannoy has joined First National Bank as Destin market president. Vannoy will manage and develop relationships within the 30A community. Vannoy has more than 31 years of banking experience in community, commercial and private banking. She is a graduate of the University of Texas at Arlington and the distinguished LSU Graduate School of Banking. She is an alumnus of the Leadership Walton Class of 2009, Leadership Okaloosa Class of 2006 and Leadership Santa Rosa Class of 2004. 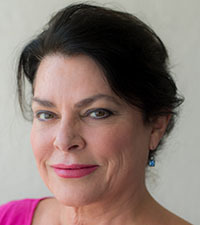 Currently, she serves on the board of Scenic Walton and Mentoring Emerald Coast and is a member of the Caduceus Society of Sacred Heart Hospital. 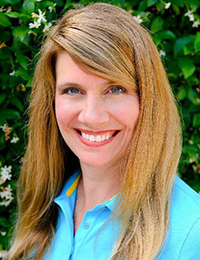 She is also a trustee of the Okaloosa Economic Development Council and a 15-year Rotarian. 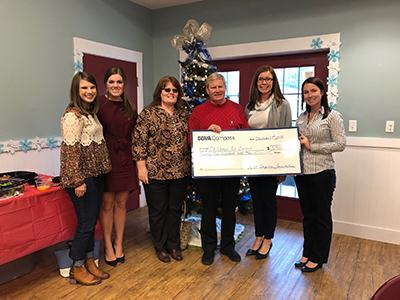 To fund the Fort Walton Beach Boys & Girls Clubs of the Emerald Coast Teen Center’s Money Matters Program, State Farm Insurance has granted the Club $3,000 to help promote financial stability among teens by building their basic money management skills. The Money Matters Program was created by the Boys & Girls Clubs to provide behavior-changing financial education to help teens on a path toward budgeting, saving, planning for college and financial freedom. Comprised of five core units--Budgeting & Living Within Your Means, Saving & Investing, Planning for College, Credit & Debit and Entrepreneurship-- this program gives teens a real-world perspective on money, reaching them at a time where their behavior as earners, spenders and savers can be influenced. Debbie Wooley (left) was recognized as the Top Sales Agent and Shannyn Stevenson (right) was recognized as the Top Listing Agent for July through September 2018 by in Newman-Dailey Resort Properties’ Real Estate Division. Wooley is a rising star within the Newman-Dailey Real Estate Sales team. She leverages her sales and marketing skills to position her listings to sell for the best possible price in the least amount of time. For sellers, she helps coordinate every detail of the listing process from photography to market analysis and is also a skilled negotiator. Wooley is a member of the National Association of Realtors, Florida Association of Realtors, Alabama Association of Realtors, Emerald Coast Association of Realtors and Birmingham Association of Realtors. As top listing agent, Stevenson knows the Gulf Coast. 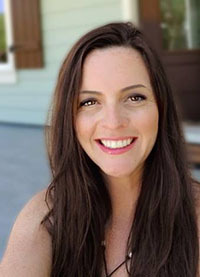 With deep-seeded knowledge of beach communities from Rosemary Beach to Destin, she specializes in selling and buying rental investments and second homes. She moved to Destin nearly four decades ago and has watched Destin grow from a small fishing village into a vibrant vacation destination. 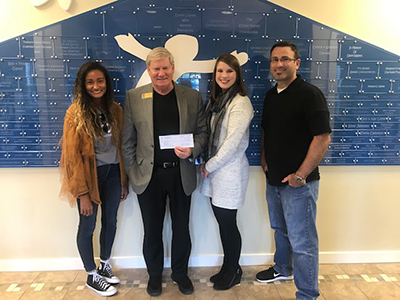 Eric Miracle right), adult ministries director, and Sierra Lawrence (left), assistant to the lead pastor, both of Beachside Community Ministries Church, presented a $5,000 donation to Ken Hair and Allie Noah (center) of Children In Crisis (CIC). Thanks to the generous donations from the members and the “Be Rich” program, the kids living at the CIC Neighborhood will have a wonderful Christmas. The donation will also help provide a home and care for the more than 100 children that will call CIC home this year. Santa’s brother is Billy Claus. He’s allergic to snow and lives in the Caribbean. But Billy Claus helps Santa every year when he arrives by seaplane at LuLu’s in early December for the kids to tell Billy what they want for Christmas from Santa. He was accompanied by the LuLuBelles, his version of the elves. Lucy Buffett was also on hand to read her book, Billy Claus and the Spirit of Christmas. 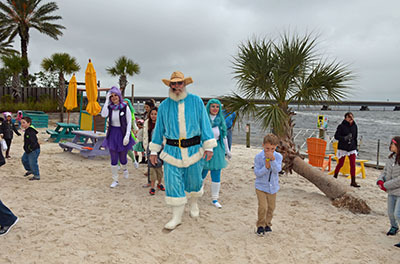 After that, kids lined the sandy beach to welcome Billy Claus when he flew in via the Choctawhatchee Bay. Sacred Heart Hospital on the Emerald Coast is proud to honor Peggy Duncan, a nurse in the hospital’s Family Birth Place, with The DAISY Award for Extraordinary Nurses®. The award is part of Sacred Heart Hospital and the DAISY Award Foundation's goal to recognize the extraordinary, compassionate care nurses provide patients and families every day. Duncan was nominated for The DAISY Award by Steve and Camille Withall, who delivered their first child at the Family Birth Place in August. 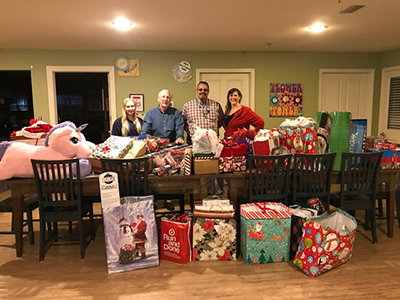 The Sandestin Golf and Beach Resort played Santa to the kids living at the Children in Crisis Neighborhood by having a Christmas “Tee Off for Toys” campaign. This is the 7th year of the event, and the collection gets bigger each year. Thanks to the awesome donations from golfers and supporters, the kids at CIC will have a great holiday season and 2019. Hyatt Place Sandestin at Grand Boulevard opened on Dec. 18, 2018. The new 5-story, 84-room hotel offers business and leisure travelers an open, intuitively designed, casual atmosphere and practical amenities, such as free Wi-Fi, 24-hour food offering,s and the 24-hour fitness center. 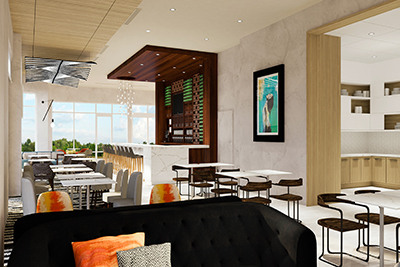 The hotel is the latest development on Grand Boulevard – a high-end lifestyle Town Center with exclusive boutiques, renowned retailers, exquisite dining options, first-class events and entertainment, and a thriving professional community. As the year comes to an end, sadly child abuse has not. Those are strong, but true words that are launching a new membership program by the Emerald Coast Children’s Advocacy Centers (ECCAC) that serve Okaloosa and Walton counties. • $25 – Friend of the Center for an individual membership. • $50 – Friends of the Center for a couple’s membership. To become a member, go to www.eccac.org/membership, or call Megan White at 850-892-0280, Ext. 417, or email meganw@eccac.org. The inaugural Destin Crafted fest was held at The Henderson Beach Resort on Saturday, Nov. 3, 2018. This craft beer, bourbon, and food festival was organized by Wine World to raise funds for Children in Crisis, Inc., a local non-profit whose mission is to support and house children in need in Northwest Florida. In December, Wine World donated festival proceeds to the charity in the amount of $13,410. Nearly 500 guests, both local and visitor, attended Destin Crafted, with events spanning from the VIP cocktail party on the sunset terrace Friday night to Saturday’s main festival on the pool deck at The Henderson. Celebrity distillers and brewers joined local restaurants and community sponsors over the weekend to provide a unique experience to fest-goers and enthusiasts. 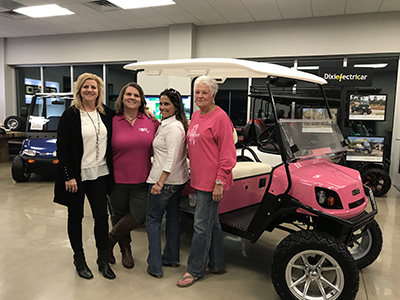 On Nov. 29, Dixielectricar raffled off a limited edition E-Z-GO golf cart to benefit Fore Her, a nonprofit serving those battling breast cancer along the Emerald Coast. The pink, L6 Express Model cart, nicknamed “Pinkie” by the Dixielectricar staff, was one of about 250 carts distributed to dealers across the United States. Together, Dixielectricar and Fore Her spent four weeks showcasing “Pinkie” throughout the community. “Pinkie” made an appearance at the Destin Commons, Seascape, Rosemary Beach, the Better Homes and Gardens Real Estate office, and Kelly Plantation raising more than $9,500 and selling close to 500 tickets. Ultimately, “Pinkie” was won by Fore Her Board Member and longtime supporter Jennifer Crawford. 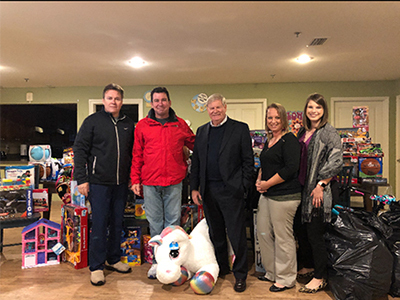 Employees of the local Boeing Company of Fort Walton Beach donated a huge amount of toys along with gift cards to help give a home and make Christmas special for the more than 100 children that will call the Children in Crisis (CIC) Neighborhood home in 2018. Seen here, left to right, are Lesley Lowrey of CIC, Ray Townsend and Jose Zpata-Ayala of Boeing, and Dr. Judy Manning of CIC. 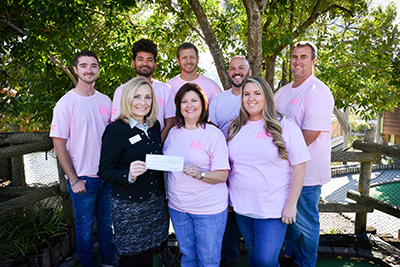 The Track Family Fun Park in Destin recently presented Sacred Heart Foundation with a check for $10,332 as a result of The Track’s 8th annual Fight the Fight, Find a Cure breast cancer fundraising event this fall. Guests enjoyed a fun-filled day of Track activities, while supporting the Women’s Health Services Fund at Sacred Heart Hospital on the Emerald Coast. The Fight the Fight, Find a Cure event was created in honor of a long-time Track manager Darla Petty, who fought and won her battle against breast cancer seven years ago. Gulfarium Marine Adventure Park is celebrating the holiday season by introducing the new addition to the penguin colony to the public. Toto, a male African penguin, hatched at the park on Sept. 12, 2018. After being reared behind the scenes for the past few months to ensure successful development, the penguin's fluffy down has now been replaced by its waterproof feathers and, following a very successful first swim, he was ready to integrate with the rest of the colony and made his debut this week. Toto will be the second chick in the Gulfarium's penguin colony that was born to parents, Ninja and Jelly. Ninja and Jelly's first chick, Becky, hatched in December 2016 and quickly became a well-known member of the Gulfarium's animal family. New mothers at Sacred Heart Hospital on the Emerald Coast have access to the highest level of breastfeeding support and education available, thanks to the hospital’s efforts to become recognized as a Baby-Friendly birth facility by Baby-Friendly USA. Baby-Friendly USA, Inc., is the U.S. authority for the implementation of the Baby-Friendly Hospital Initiative (“BFHI”), a global program sponsored by the World Health Organization (WHO) and the United Nations Children’s Fund (UNICEF). The initiative encourages and recognizes hospitals and birthing centers that offer an optimal level of care for breastfeeding mothers and their babies. 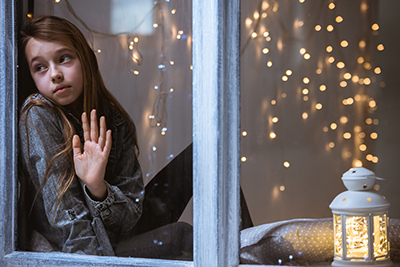 BBVA Compass continued its great support to Children In Crisis (CIC) again this year. Thanks to the generous donation of $2,500 from the Healthy Habits for Healthy Kids program, all the kids living at the CIC Neighborhood will receive specialized training and counseling. Seen here, left to right, are Allie Noah, CIC development director; Lane Redding, BBVA Compass; Christi Osborne, BBVA Compass; Ken Hair, CIC president and CEO; Katie Sharon, BBVA Compass; and Robin Donlon, BBVA Compass. Henderson Park Inn and The Henderson have launched a collaborative “Love Locals” program as a show of support and appreciation for the Emerald Coast community. The neighboring properties have curated a special, collective program featuring seasonal offers on accommodations, dining, and spa services. These specials are available for all full-time Florida residents living in Bay, Escambia, Okaloosa, Santa Rosa, or Walton County. Those who enroll in the Love Locals program will receive discounted rates on room nights at Henderson Park Inn, as well as a complimentary bottle of wine with the purchase of two entrees at Beach Walk Café, the Inn’s signature restaurant. For details, visit https://www.hendersonbeachresort.com/love-locals or https://www.hendersonparkinn.com. Airmen from Hurlburt Field ISOMXS Squadron helped the kids living at the Children In Crisis Neighborhood by having a Christmas/New Year’s Toy Drive. Thanks to the generous donations, the kids received toys and gift cards to help them have a happier holiday season and a better New Year. Seen here, left to right, are Airmen from Hurlburt Field ISOMXS Squadron, including Madelyn Harrigan, Brittany Killen, Kiya Ortiz, Brandy McMullan and Brittany Bell. Sacred Heart Hospital on the Emerald Coast has named Brenda Real as the new nurse manager of the Medical Surgical Unit at Sacred Heart Hospital on the Emerald Coast (SHHEC). Real comes to Sacred Heart from the University of Alabama-Birmingham (UAB) where she served in roles including RN in the pre-procedure and post-surgical units, and Heart and Vascular Center, and as a nurse manager and research nurse coordinator. Prior to her joining UAB she served at Ascension’s St. Vincent’s East in Birmingham as a registered nurse in various settings. She brings more than 17 years of nursing experience to her new position. Café Thirty-A held its annual Christmas Charity Ball on Friday, Dec. 7, 2018, and raised a total of $26,200 for Caring and Sharing of South Walton, an organization which provides food and financial assistance to area families and individuals in need. Guests were invited to delight in beautiful holiday décor, a buffet, passed heavy hors d’oeuvres, and a champagne toast upon entry. In addition to the commemorative holiday-themed photo booth by Epic Photo Co. and music provided by Rock the House, event goers also had the opportunity to view and shop various pieces from McCaskill & Company. Fifteen percent of the jewelry sales from the evening additionally went to Caring and Sharing of South Walton. Seen here, left to right, are Kim Hope, director of Caring and Sharing of South Walton, and Harriet Crommelin, owner of Café Thirty-A. 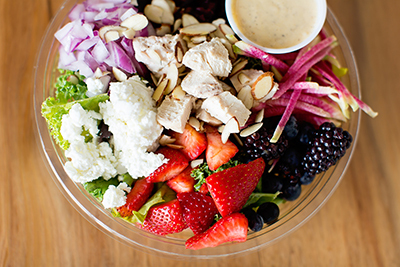 Everkrisp has recently added a new service to its signature farm-fresh repertoire with a pre-made, pre-packaged meal prep service at both the Destin and Miramar Beach locations. In addition, Everkrisp has expanded the menu to include a variety of hearty options, such as wraps and sandwiches. Salads, grain bowls, breakfast options, wraps, sandwiches, and now meal prep services make up the expanding menu of choices Everkrisp has to offer. Whether customers are on the go and need something fast, or wanting to sit down and enjoy their meal, Everkrisp always has dishes that are fresh and delicious. 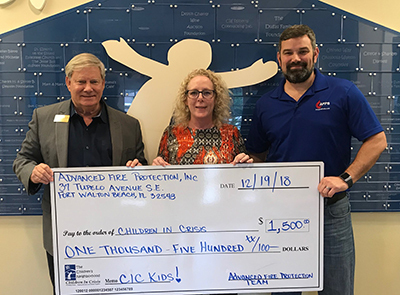 Ken Hair, Children In Crisis (CIC) president and CEO, accepts a donation of $1,500 from Jackie Kirly and Michael Sudheimer representing Advanced Fire Protection Services. The funds will be used to give local at-risk foster children a safe, loving home at the CIC Neighborhood.